The Callanan story leads to Ellsworth and Jewell. This was adapted from the story printed in the South Hamilton Record News on August 8, 1978. Ever wonder where and when Jewell and Ellsworth got their names and how they came to be? We must go back in time to a place called Callanan and North Callanan. Callanan was located in North West Ellsworth Township and North Callanan was located north across into Lyon township. The two towns adjoined each other and were considered as one during their brief history. The people in the area wanted a railroad so badly they voted a 5 percent tax on themselves to secure one. To secure this tax, they said that any railroad must pass within one mile of the intersection of all four townships. James Callanan, president of the Des Moines and Minnesota Railroad, decided to continue the line north from Ames in hopes that it would eventually run into Minneapolis. The town was to be named after the first settler, but residents decided to name it Callanan in honor of the president of the railroad. David Schoonmaker was the first postmaster, starting in 1878. There were two newspapers printed in the town and one reported that the postmaster was somewhat of a scoundrel, as he held up mail for Lakin's Grove to hold down the count, therefore making the Callanan post office look better. Early reports also indicate that many parties from Ames and Des Moines came up to the beautiful worked area to let their hair down. When many of the locals complained of the roudiness, they were told by the town founders that this was good for business. This atmosphere contributed to the fact that two murders were committed in the short life of the town. Callanan had 200 people. The business register showed two surgeons, several contractors, a hotel, a boarding house, three painters, a hardware store, a drug store, a dry goods store, a pool hall and a barber shop combined, a brick yard, a blacksmith shop, a carriage and wagon shop and a meat market. Charles Lakin was the barber and ran the pool hall and he was also a dealer in coal, hair, lime, and farm machinery. The railroad went bankrupt, however, and the Toledo and Northwestern took over in 1880, and a full gauge line was laid from Tama City through the county on the roadbed now owned by the Chicago and Northwestern. 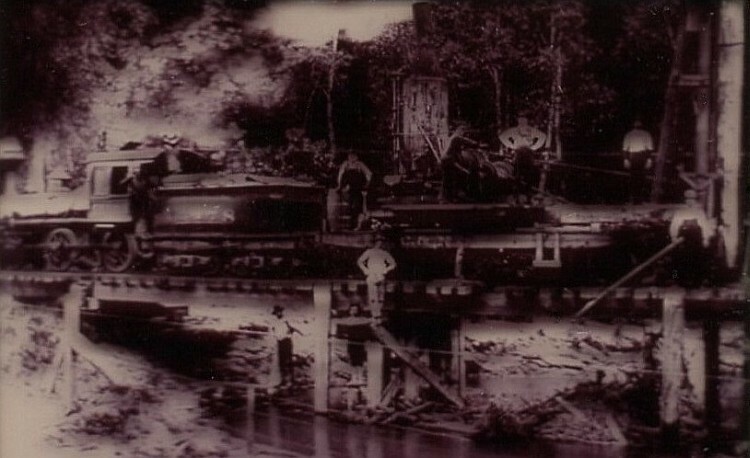 When the Chicago and Northwestern Railroad came through, the county the east-west branch formed a junction with the North-South branch and that portion of the line that ran into Callanan was abandoned. Another source states that the town was named after a railroad official. In 1900 the population of Ellsworth was 319 and the population of Jewell was 947, mainly because both line's of the railroad intersected there. Thus, the town of Callanan, which was located about one mile south and west of Ellsworth was no more. The post office was closed on October 12, 1881. 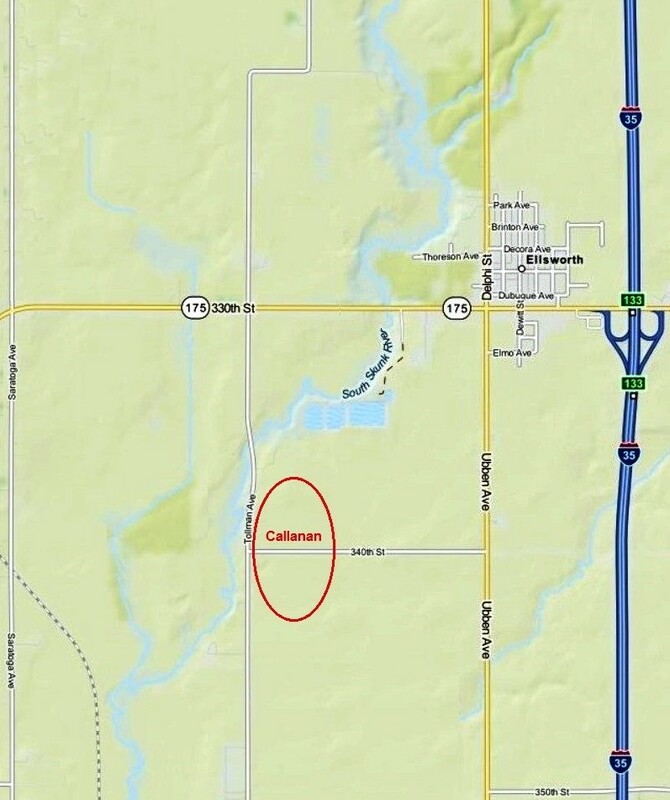 However, there was a Junior High School and a Callanan College in Des Moines named after James Callanan. This college was one of several that were combined to become Drake University.